It is tough sometimes being an innocent abroad even an informed innocent. Last Tuesday evening I ran across Taksim Square , Istanbul , in a rush to get to the first of two evening receptions where my aim was to network like mad for Scottish education. As the second function was being hosted by Universities Scotland I had my kilt on. My guide to the city was the usual hastily grabbed map from the hotel lobby affixed with two biro crosses by the concierge. Yes, I have all the gadgetry but sometimes even in London I can't get a GPRS signal. Darkness was falling , I was running , running late and over heating when I got to the far side of Taksim Square and met the first row of police. I realised immediately that something was amiss . I realised too that the phalanx was quite large and blocked my planned route up and through Istiklal Street . This was where the comedy started. As I stood studying my map looking for an alternative route around the roadblock, a friendly, helpful policeman studied my predicament too and then pitying a sweaty foreigner , in a dress, with a map wholly inadequate for navigating the back streets of Istanbul , he allowed me through the police lines. I strode on down Istiklal Street - it is really beautiful. I met another row of policemen , used sign language to explain that their colleagues had let me through and they waved me passed too. My thoughts were now on white or red ? , sneaking a cigarette before I made my entrance and what gastronomic delights lay ahead. 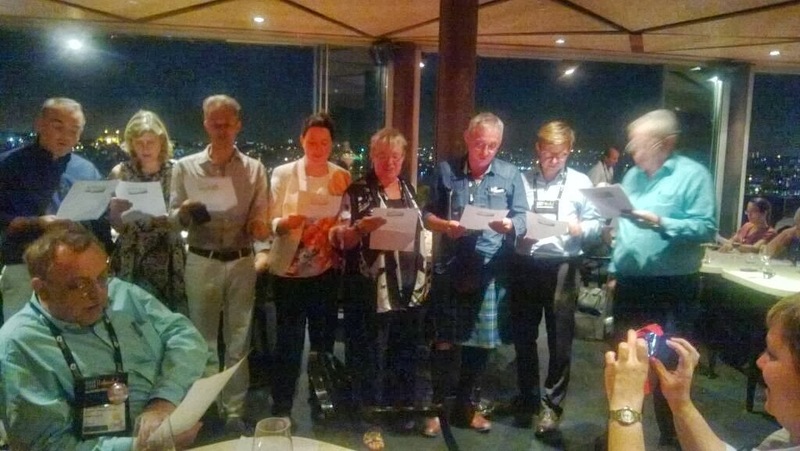 This was the first night of the conference and I was hoping for Baba Ganoush, Kofte Kebabs , steaming bowls of aromatic couscous and other Turkish delights. I now too had the perfect excuse for arriving my usual ten minutes or so late . So intent was I on my own musings that I hardly noticed that the street was busier now , even crowded. Quite a lot of nice smiling students poked some well meaning fun at the alien figure in the kilt striding through their midst. I was now at the top of Istiklal Street and within half a mile of my final destination, only a few junctions and two more turns to navigate. I am not sure when I noticed the immoveable shield wall. But it was suddenly right in front of me. You instinctively know when presented by authority's sternest face that negotiation here would be futile . As I turned smartly on my heels to find a lane or an alley way to allow my continued progress. I noticed that some of the students I had just passed appeared now to be in some kind of fancy dress. As I squeezed passed them , my pace quickened as I noticed they were actually pulling up ultra style scarf face masks and some of them had unmistakably either gas masks or some other sort of full head hood to protect you from chemical weapons. I was now jogging to get away from this potential confrontation. I did not need to look around to know that the riot police were charging down the hill . I was now a sprinting man in a kilt doing my best to negotiate a rapid descent down a cobbled poorly lit street. The steps outside basement bars and restaurants now threatened broken limbs, as some of the swifter protesters elbowed me in our shared eagerness to keep away from and ahead of the riot police. Probably just at the moment as I heard things being fired at us and ricocheting off the buildings around us , a well lit lane with some alarmed looking diners appeared to my left . I pitched down this , was quickly identified as a hapless tourist and was ushered into the bar with the other startled guests . The shutters came down as the streets filled with shrieks and tear gas. And now I know basement bars are not good places to hide from tear gas. Postscript - That evening I was just in the wrong place at precisely the wrong time - the following evening I traveled the same route for dinner at the British Consulate without incident . I actually thought that the police were letting me through as I was heading away from any trouble spots. Istanbul is one of the largest cities in the world at almost 14 million and while like any city you have to keep your wits about you I would have no hesitation in going back and taking my family with me , the folk are friendly and the glimpses I caught of the ancient city were spectacular. When I finally got some, the food too as might be expected is exceptional. Wow! Sounds like a nightmare, Joe! Glad you lived to tell the tale. Think worst that may have happened is that I may have skinned my knees or slightly worse - I was not taking photographs but it did seem clear police were targeting some of the protestors for special attention. My kilt marked me out as an idiot abroad - so really protected me. I've not been tear gassed before - it was really unpleasant - especially in an enclosed space. We emerged about 3 hours later - it took about 4 showers to get the stuff off me and out of my face when I got back to the hotel. The guys with the full face masks - they mostly turned out to be local journalists.